Welcome to Madhya Pradesh, in the centre of India. Arrive at Jabalpur and proceed to Bedhaghat. Night halt at Jabalpur. Morning enjoy a Boat ride at Bedhaghat on the Narmada river. The river cuts through huge white marble rocks which is a sight to behold. Visit the magnificient Dhuandhar falls. 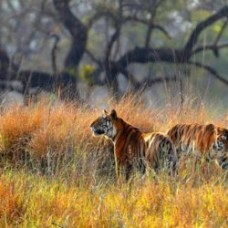 Proceed towards Bandhavgarh. Night halt at Bandhavgarh. Bandhavgarh has the highest density of tigers in India. Enjoy jungle safari. Night halt in Bandhavgarh. Proceed to Khajuraho, the land of mystic temples. Evening at leisure. Visit the 1000 year temples of Khajuraho built by the Chandela Dynasty. Visit the Kandariya Mahadeva, Lakshman and the temples. Night halt at Kahjuraho. Proceed to Gwalior. En-route visit to Jhansi fort. Later visit to Orchha which includes Jahangir Palace, Raj Mahal, Raj Parveen Mahal. Night halt at Gwalior. Proceed to Railway station for return journey. Tour ends with happy memories of the trip.